NETWORK FINALS: FOX’s US OPEN coverage held at 0.4 in final numbers. Elsewhere, the NCIS: LA and MASTERS OF ILLUSION reruns each lost 0.1. CABLE HIGHLIGHTS: Discovery’s ALASKAN BUSH PEOPLE led Friday cable, down 0.02 to 0.64, with lead-out HOMESTEAD RESCUE at 0.40. On Adult Swim, DECKER: UNCLASSIFIED was at 0.59, and CHECK IT OUT was at 0.45. Part four of ESPN’s documentary series OJ: MADE IN AMERICA fell 0.18 from Wednesday’s chapter to 0.47, and an afternoon EURO 16 Spain vs. Italy match was at 0.31, with earlier games at 0.23/0.21. The COPA AMERICA Peru vs. Colombia match scored 0.39 on Univision and 0.30 on Fox Sports 1. Disney Channel’s GIRL MEETS WORLD ticked up to 0.34, and lead-in STUCK IN THE MIDDLE held at 0.24, the same rating as lead-out WALK THE PRANK. 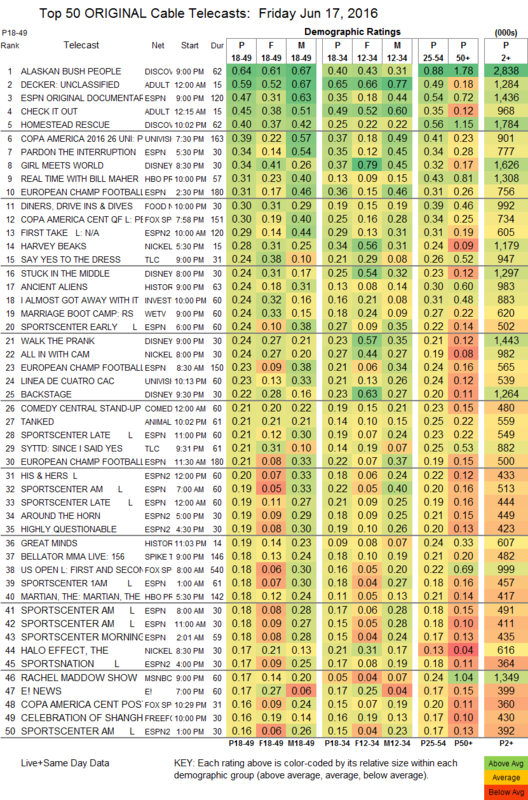 On HBO, REAL TIME WITH BILL MAHER was steady at 0.31, and VICE lost 0.03 to 0.15. Food Network’s DINERS, DRIVE-INS & DIVES ticked down to 0.30. 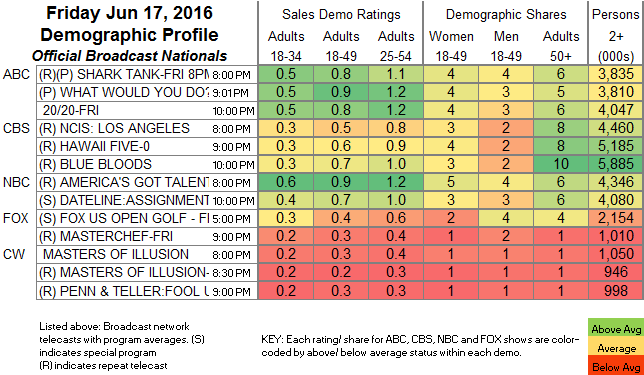 TLC’s SAY YES TO THE DRESS was at 0.24, with a lead-out SINCE I SAID YES spin-off at 0.21, compared to 0.17/0.15 for 2 SAY YES episodes last week. History’s ANCIENT ALIENS fell 0.04 to 0.24. We’s MARRIAGE BOOT CAMP lost 0.12 to 0.24. Spike’s BELLATOR LIVE was at 0.18. On Syfy, WWE was down 0.02 to 0.12, and WYNONNA EARP fell 0.03 to 0.10. Cinemax’s OUTCAST dropped a hundredth to 0.06.